Bond Economics: 2015 Lift-Off Isn't Looking So Good. Let's Start Talking About 2016! 2015 Lift-Off Isn't Looking So Good. Let's Start Talking About 2016! Although Fed speakers have been promising a rate hike "in 2015," for what seems like forever, the latest data have possibly pushed the "lift-off date" into 2016. I may be premature with this, as the Fed may want to do a token hike to get the 0% monkey off their back. However, with risk markets swooning, such a move could easily look incredibly stupid, even if it appears useful psychologically. There is little doubt that the manufacturing sector is much less important than it was during earlier decades. That is what happens when you lay off all your domestic workers: you no longer make much of a difference for employment statistics. This was a key error of bond bears in 2010: they looked at the strong ISM data and blindly compared the readings to previous cycles. However, the last recession killed off the manufacturing employment base, and so it made little difference even if it grew at a double-digit percentage annual rate. 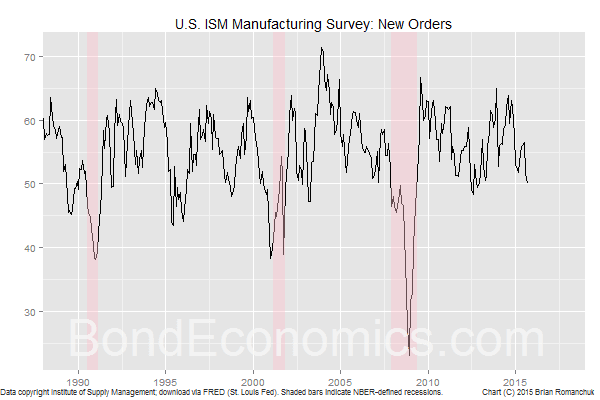 Therefore, one could argue that the ISM manufacturing index -- once the best cyclical indicator -- is somewhat "broken." Even so, the manufacturing sector is the most cyclical part of the economy, and so if there is a slowdown, it should show up there first. As a result, the rather scary-looking ISM New Orders chart above, is one indicator that that points to a possible near-term recession. That said, it provided once false alarm already during this (weak) expansion, and it is unclear that the weakness in manufacturing and the energy sector will be enough to overcome the inertia provided by the less cyclical services sector and the automatic stabilisers created by government policy. 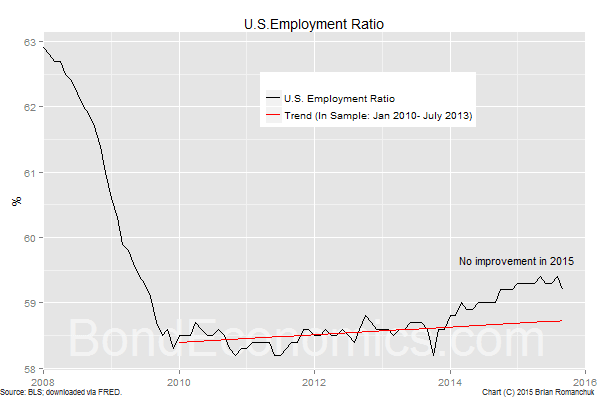 The U.S. labour market data was as tepid as I would have expected. I had no idea why various hawks were whispering about signs of acceleration that would allegedly be unveiled in the latest report. The employment-to-population ratio has not budged at all in 2015, which is a sign of a broken job market. Sure, there's demographics, but demographic trends are glacial, and should be overwhelmed by the cycle. At this point, a degree in economics is useless for the practice of Fed-watching. A far more useful background appears to be anthropology. How will a tribe with an extremely ingrained groupthink react when their shamans' predictions about the future prove to be consistently incorrect? Will the shamans bend their predictions to match observed real-world behaviour, or will they dig in, and set policies based on their professed beliefs, and hope for a crisis that provides covers for their predictive failures? My short time at a central bank: Very academic environment with an obsession on quantitative methods (econometrics + dsge). Anything that wasn't published in a top economics journal is not worth a dime to them. When Kindleberger's co-author came in to talk about current events there were maybe 10 people tops in the lecture room, however when a top academic came in to give a talk on how to calibrate DSGEs the room was jam packed. General knowledge of historical economic events was very poor and just as reactive to headlines as traders. Yeah it was very tribal. Yes, this seems to be a problem partly imported from academia. As an ex-academic, my feeling is that academia is in a generally dysfunctional state, with macroeconomics being a particularly bad example. Many fields - macro in particular - are not advancing enough to justify the amount of papers being produced, so it just devolves into tribal publishing games.